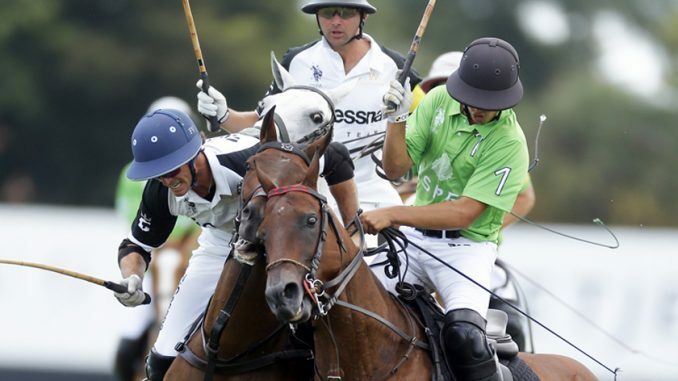 The final two games in the opening round of the 2019 CaptiveOne U.S. Open Polo Championship® produced an exciting 9-8 overtime victory for Las Monjitas over Daily Racing Form, while Aspen defeated Cessna Polo Team 14-8 in front of the grandstand on Field 1 at the International Polo Club Palm Beach. The first game of the day was a scrappy affair that had both teams attempt seven penalty shots, while struggling to generate offense from the field. Las Monjitas held the edge in open play, while Daily Racing Form couldn’t get past a tough Las Monjitas defence to shoot just 2 for 12 (17%) from the field. Scoring zero field goals in the opening half, Daily Racing Form was able to remain within one goal due to three penalty goals from Agustin Obregon and Jared Zenni. Controlling possession in open play, las Monjitas was led by Hilario Ulloa who finished the first half with three assists to give Las Monjitas the 4-3 lead. The fouls continued to increase over the second half, with few opportunities occurring in open play, while Francisco Elizalde and Zenni traded goals from the penalty line. With the score tied at 5-5, an exciting final chukka saw each team score three goals, with Zenni scoring all three for Daily Racing Form to send the game into overtime. As was the case throughout the game, fouls proved to be the deciding factor, with two fouls for Daily Racing Form resulting in a Penalty 2 conversion for Elizalde to secure the overtime victory for Las Monjitas.